Nothing is left to chance in the Deluxe Suite. The most modern comfort meets the ancient architectural tradition, with stunning attention to detail, where guests can only feel special like Royalty. 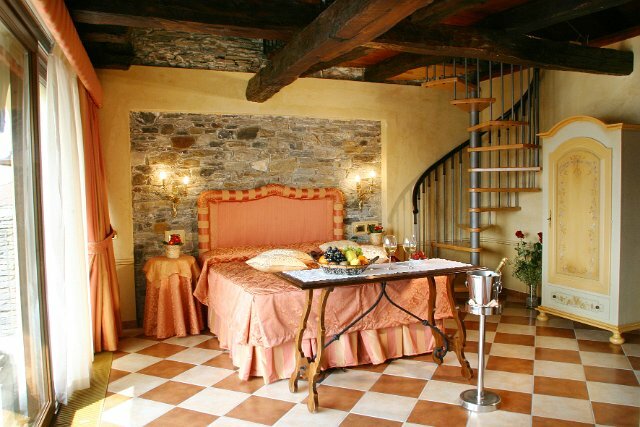 A very romantic atmosphere is given by the warm and relaxing pink tones, the original stone walls and the impressive beams holding the living area in the upper space. There is a romantic Jacuzzi for two people right in the room; from here there is a superb view of the island just framed by the granite columns. 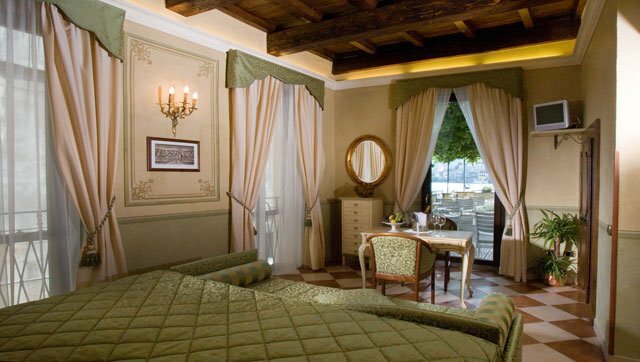 The incredible lake and island’s view from this room is the real treasure. 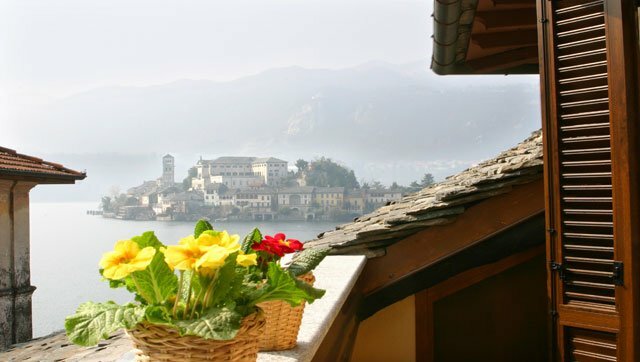 From the large window facing the private balcony the view is a landscape that can be admired just like in a painting without any interruptions. The King Suite is mastered by the impressive King size bed. 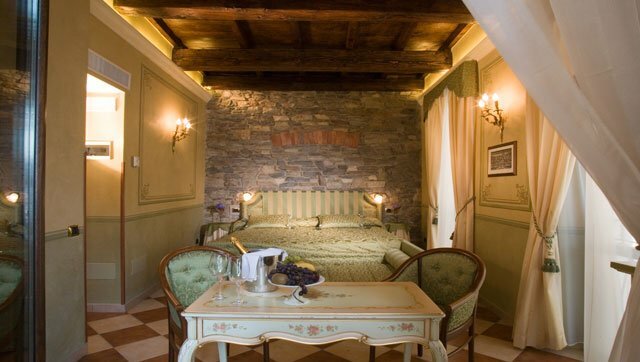 The magic of this ancient town is here reconstructed through the luxury of the furniture meeting the simplicity of the ancient stone and the original false wooden ceiling dating back to 1600. The bathroom, developed on relaxing green tones, hosts a very comfortable Jacuzzi for two people. From the room there is direct access to the nice first floor terrace which faces the island. The Junior Suite number 301 is a large warm and comfortable room with a welcoming living room. The key elements of the sun and the lake create a magical atmosphere: they are reflected in the gold and turquoise used in the furniture. For those who love history there is an interesting blazon depicting a rampant lion on one of the walls, recalling the traditional coat of arm of the Albergo Leon D’ Oro. 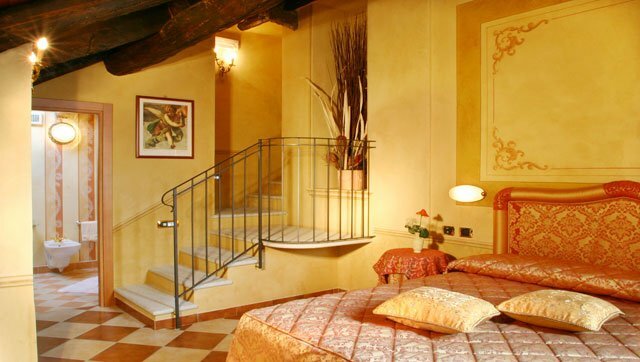 The attention to detail is further confirmed in the bathroom where the large hydromassage shower can accommodate two people and the original beams are beautifully restored and give a sense of continuity from the bedroom..
From the private balcony there is a 180° panoramic view: going from the main square “piazza-salotto” to the island of Saint Giulio. Calm and tranquillity like in a pearl are the key elements for this room. This is achieved through romantic red tones meeting the dark wooden beams and finely decorated walls.A small special living area with refined furniture frames the island among the view from the typical stone roofs. The architectural renovation has followed the tradition to keep the original materials creating a modern fusion with the accessories. 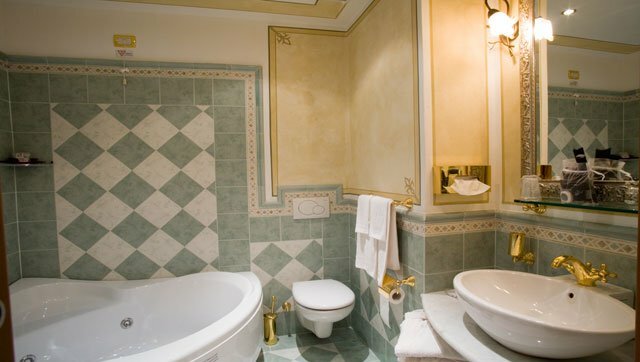 The bathroom, fully decorated by master artisans, has every comfort including a hydromassage shower. The skylights give further emphasis at the strong colours of this room. 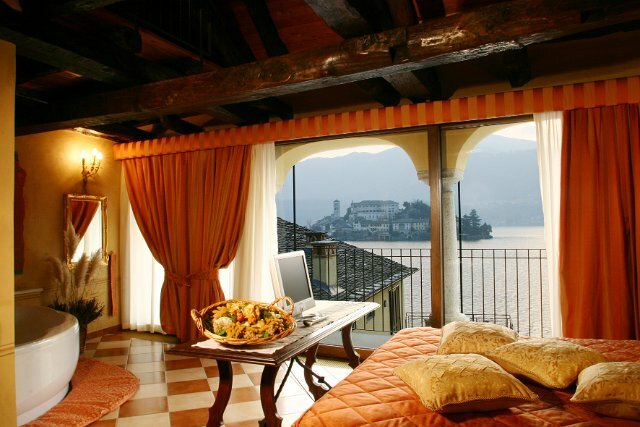 The unique romantic atmosphere of this charming room is given by the background with the stunning view of the Island of San Giulio.